The luck of the Irish wasn’t with the students at Creeds Elementary as they hunted down a wee little foe – a mischievous leprechaun who wreaked havoc at the school for weeks. It started out innocently enough with a few misplaced school supplies then escalated to an incident in the nurse’s office. There were cotton swabs that mysteriously turned green and chairs wrapped in gauze. “This guy is very sneaky and devious as we’ve seen here at Creeds,” said Barbara Messina, gifted resource teacher. Then, a final straw – green footprints in classrooms and even the restroom in Nancye Flinn’s third grade class. “We found tiny green footprints on the toilet and on some of the desks, too.” said Flinn. Fortunately, students in the second and third grade classes at the school had read the book “The Leprechaun Trap.” In the book, Liam the Leprechaun, plays similar pranks. So, students recognized the signs. They knew the only way to stop the Creeds leprechaun, affectionately known as “Lucky,” was to catch him in a trap on St. Patrick’s Day. For days leading up to March 17, students collaborated to use simple machine concepts and materials to build and test their small but sturdy traps. Many of the supplies for the lesson were purchased with money provided through a school wide Virginia Beach Education Foundation grant. The leprechaun traps were just one activity in the yearlong “Growing Through STEM” grant project funded by The Breeden Company. Ava Kidder, third grader, purchases materials with gold shamrock coins from school volunteer Steve Ayala. 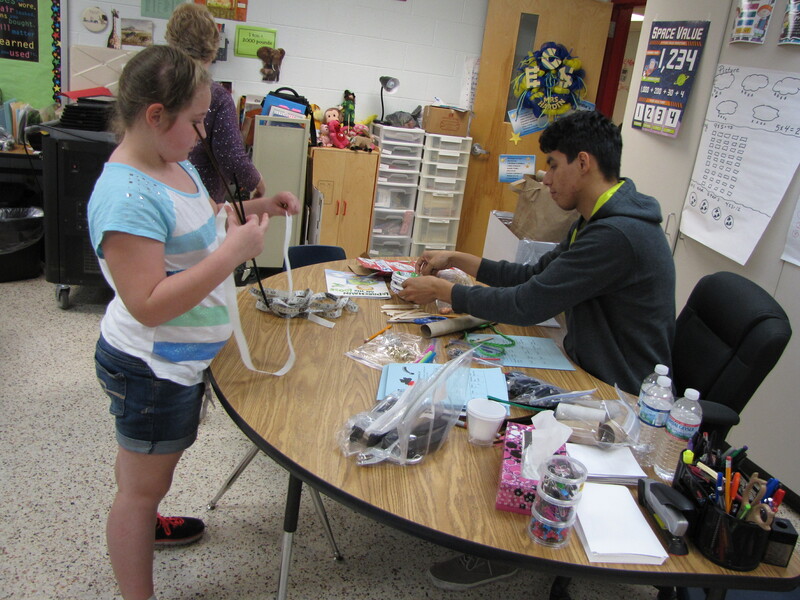 In total, 100 students helped to design, build and set 20 traps in the halls and classrooms of Creeds Elementary. Third graders, Charlotte Bergren (center) and John Newell (left) with second-grader Tucker Rupe (right) made sure to poke holes in their trap so that students could see him when we caught him. Third graders, Charlotte Bergren (center) and John Newell (left) with second-grader Tucker Rupe (right) work on their project. When students arrived to school on St. Patrick’s Day they quickly ran to their traps in hopes of finding Lucky and his pot of god. Unfortunately, luck wasn’t on their side and all of the traps were empty. I’m the infamous leprechaun from Creeds. Who performed many mischievous deeds. Design a trap! We might meet! But ha ha! Here’s a treat! To you-from me-the mischievous one from Creeds! Disappointed students haven’t given up hope, though, of meeting Lucky. “We’ll try again next year,” said third-grader Jack Yoder.